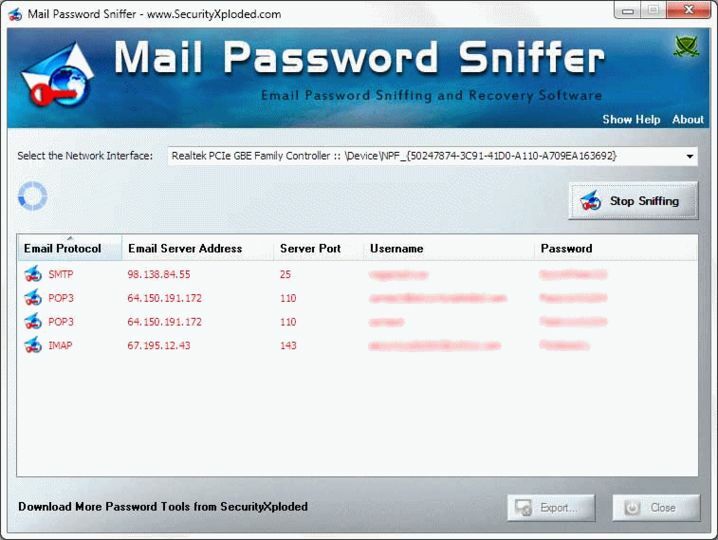 Mail Password Sniffer is a freeware password sniffing and recovery software that helps recover mail account passwords passing through the network. The tool is available for free from SecurityXploded.com. It can detect passwords passing through the network for all major mail protocols including POP3, IMAP and SMTP. It can recover mail account passwords from all the Email applications such as Outlook, Thunderbird, Foxmail etc. For each recovered Email Account, it displays Email Protocol, Server IP Address, Port, Username & Password. For best results, you should run this software on a network gateway system where all the network traffic is passing through.